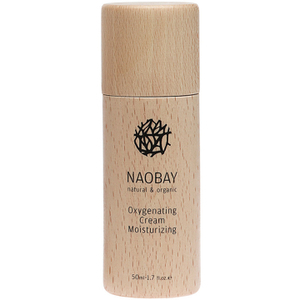 Protect and regenerate your complexion with the Oxygenating Cream Moisturiser from NAOBAY (Natural And Organic Beauty And You). Suitable for all skin types, its blend of Rosehip and Sweet Almond Oils reinforce the skin's hydrolipidic film, whilst providing optimum hydration to leave your complexion soft, smooth and supple. Fast-absorbing and ultra-lightweight, the breathable formula creates a flawless make-up base. 98.83% of the total ingredients are of natural origin. Apply sparingly to dry, cleansed skin. Aqua (Water), Caprylic/Capric Triglyceride, Aloe Barbadensis (Aloe Vera) Leaf Extract*, Methyl Glucose Sesquistearate Propanediol Glyceryl Stearate SE Stearyl Alcohol Glycerin Rosa Moschata (Rosehip) Seed Oil*, Prunus Amygdalus Dulcis (Sweet Almond) Oil*, Butyrospermum Parkii (Shea) Butter*, Persea Gratissima Oil*, Chamomille Recutita (Matricaria) Flower Extract*, Benzyl Alcohol, Dehydroacetic Acid, Potassium Sorbate, Sodium Benzoate Parfum (Fragrance) D-Limonene Citral, Linalool.